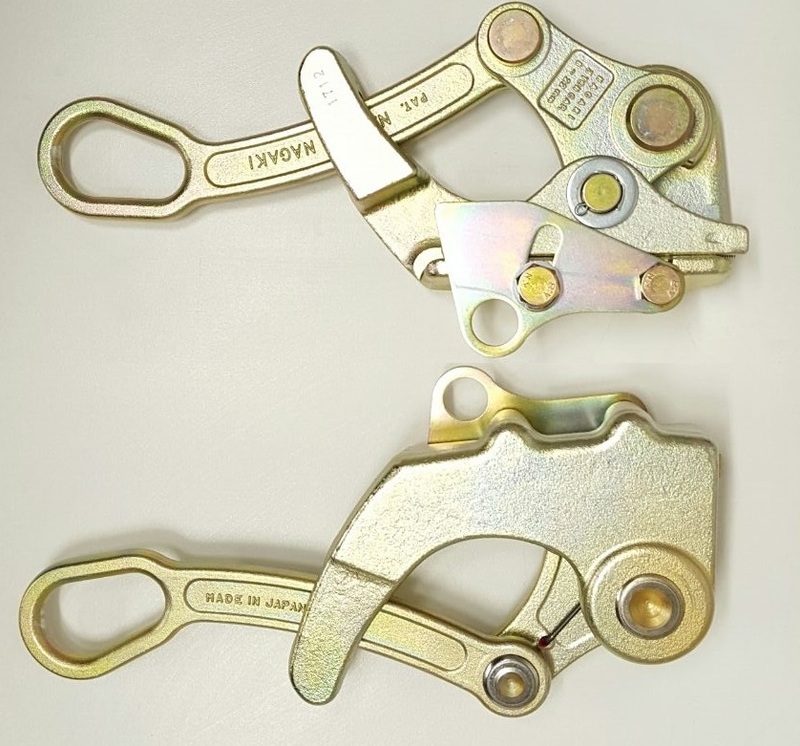 RMCS stocks a wide range of NGK Wire Grips – from the 1 tonne L-Grip which can be used for bare copper cable, covered conductor and messenger wire – to the ABC Grip which is used for aerial bundled cable – to the 4 tonne Wire Grip which can handle cables measuring up to 28mm in diameter. 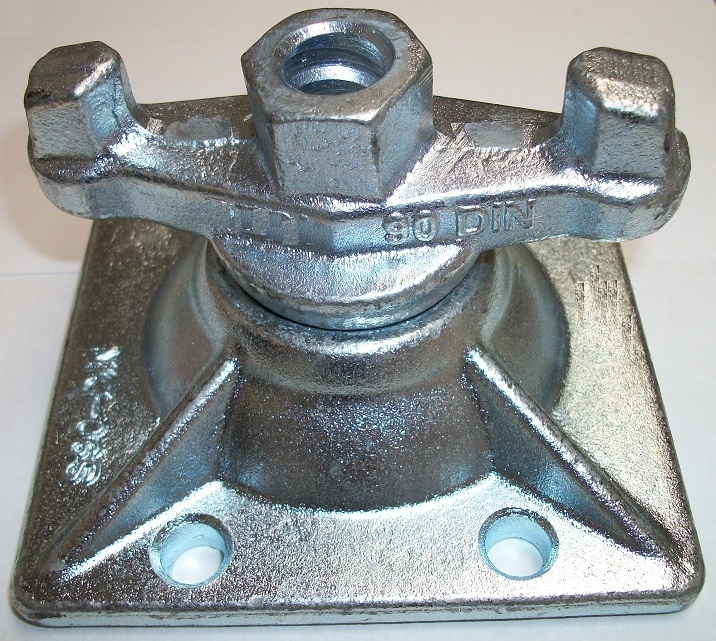 All of the models are rated for a variety of wire sizes and types – that means fewer wire grips are needed. MINI-GRIP MINI GRIP - Nagaki wire grip with safety latch - safe load: 5Kn (0.5 Ton) For steel rod, barbed wire and messenger wire, weight 0.3 kgs. 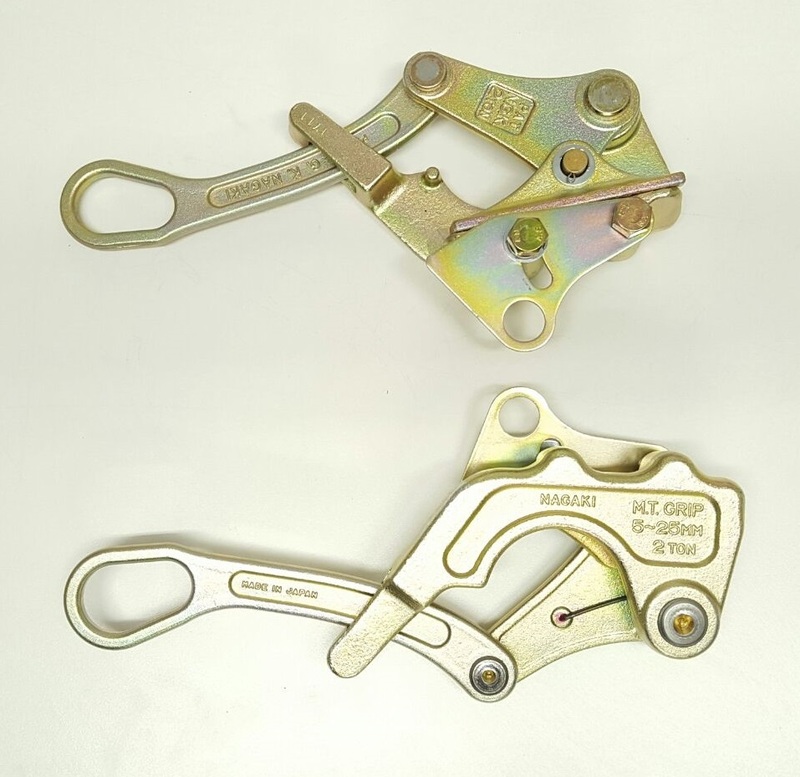 SD-L-GRIP SD-L-GRIP - Nagaki wire grip with safety latch - safe load: 10Kn (1.0 Ton) For steel rod, copper cable and messenger wire, weight 0.6 kgs. 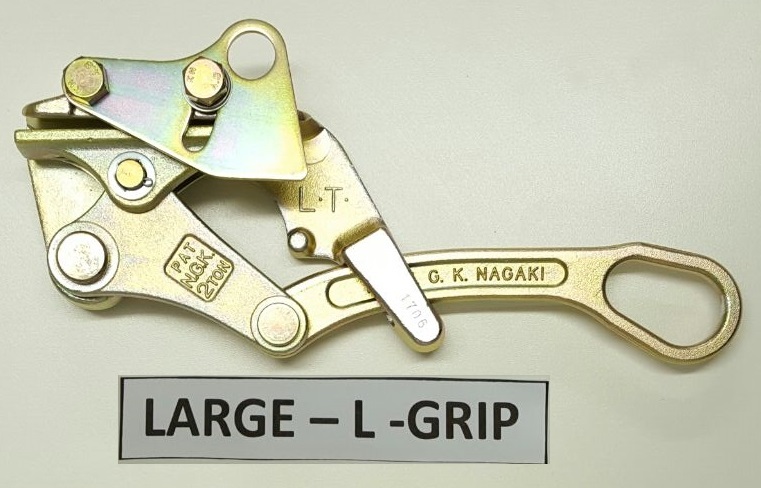 1TON-L-GRIP 1TON-L-GRIP- Nagaki wire grip with safety latch - safe load: 10Kn (1.0 Ton) For bare copper cable, covered conduct0r and messenger wire, weight 1.1 kgs. 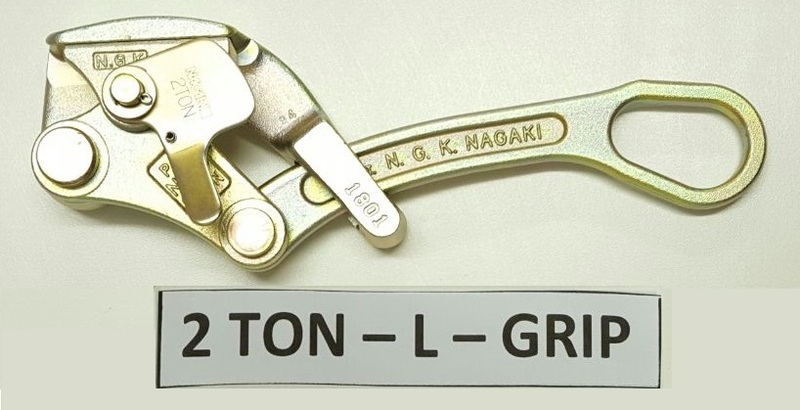 2TON-L-GRIP 2TON-L-GRIP- Nagaki wire grip with safety latch - safe load: 20Kn (2.0 Tonn) For bare copper cable, covered conductor and messenger wire, weight 1.3 kgs. 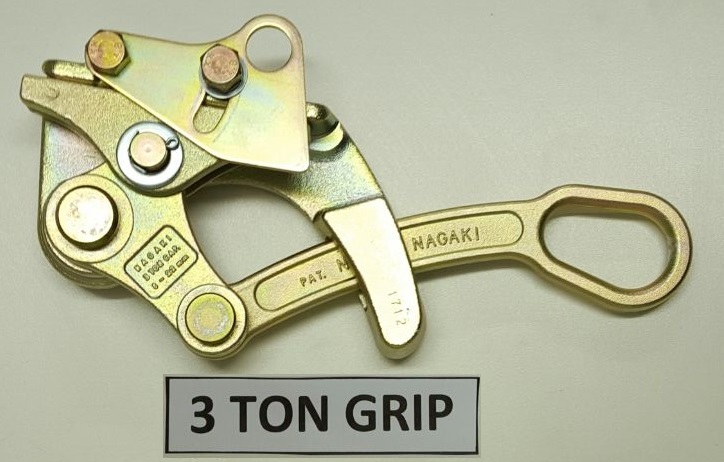 3TON-GRIP 3TON-GRIP- Nagaki wire grip with safety latch - safe load: 30Kn (3.0 Ton) For wire rope, messenger wire, copper cable and trolley cable, weight 3.0 kgs. 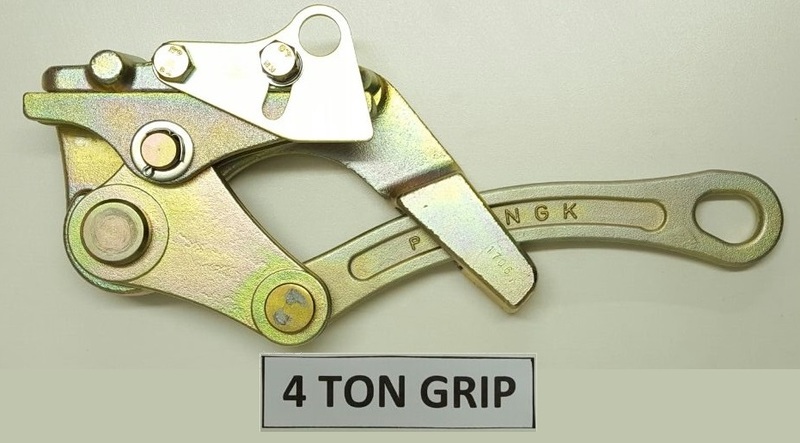 4TON-GRIP 4TON-GRIP- Nagaki wire grip with safety latch - safe load: 40Kn (4.0 Ton) For wire rope, messenger wire, copper cable and trolley cable, weight 5.0 kgs. 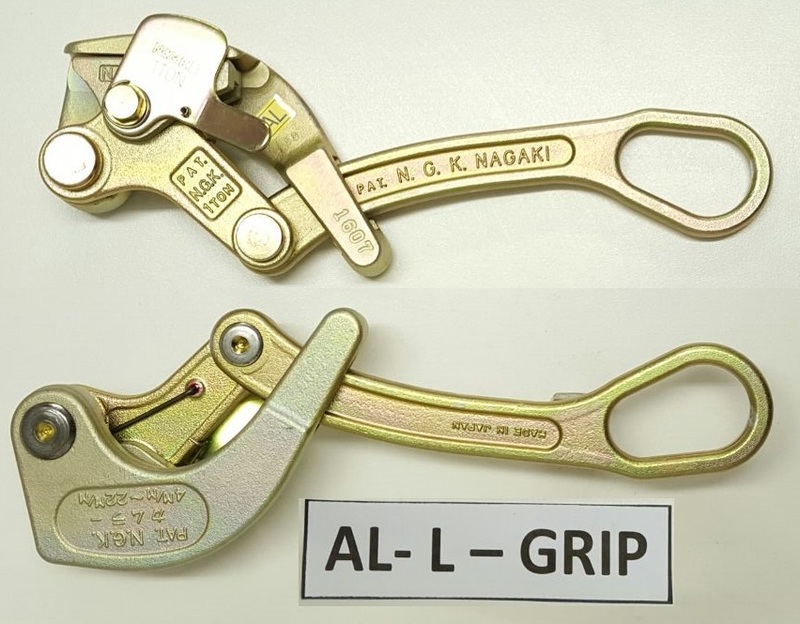 AL-L-GRIP AL-L-GRIP- Nagaki wire grip with safety latch - safe load: 10Kn (1.0 Ton) For wire rope, messenger wire, copper cable and trolley cable, weight 5.0 kgs. AL-LARGE-GRIP AL-LARGE-GRIP- Nagaki wire grip with safety latch - safe load: 20Kn (2.0 Ton) For bare aluminium and bare copper cable, minimal damage to conductor, weight 1.1 kgs. 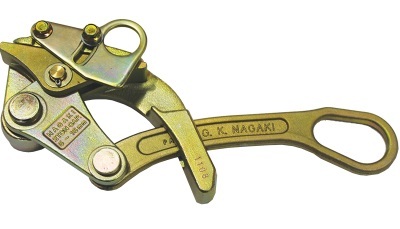 LARGE-L-GRIP LARGE-L-GRIP- Nagaki wire grip with safety latch - safe load: 20KN(2.0T) For copper cable and covered conductor, weight 2,1 kgs. 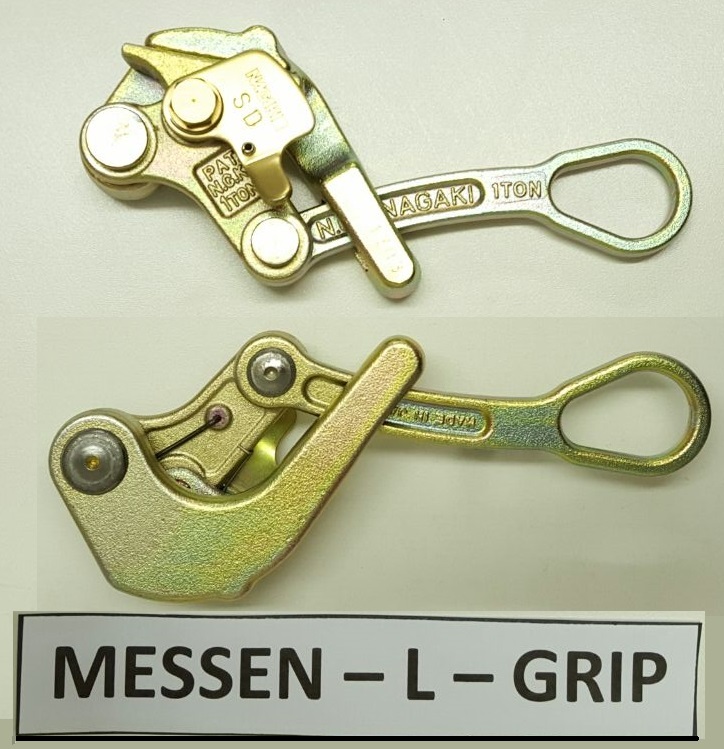 MESSEN-L-GRIP MESSEN-L-GRIP- Nagaki wire grip with safety latch - safe load: 10Kn (1.0 Ton) For copper cable and messenger wire weight 0,7 kgs. 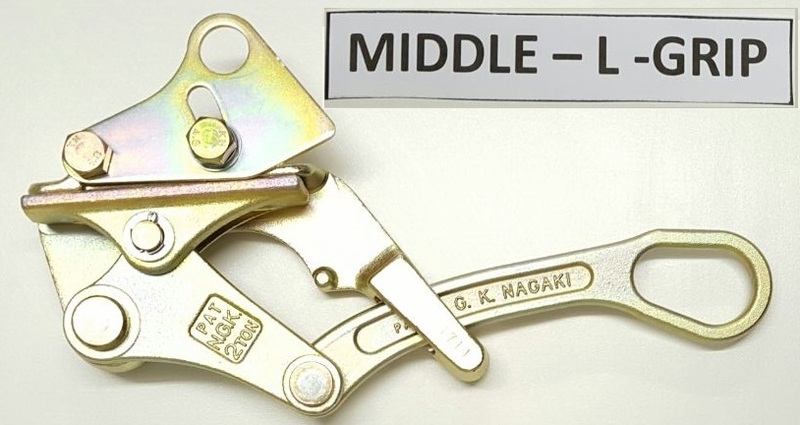 MIDDLE-L-GRIP MIDDLE-L-GRIP- Nagaki wire grip with safety latch - safe load: 20Kn (2.0 Ton) For copper cable, covered conductor and messenger wire weight 1,8 kgs. For copper cable and messenger wire. For steel rod, barbed wire and messenger wire. Click on left PDF icon to download RMCS Nagaki Brochure 1. Click on right PDF icon to download RMCS Nagaki Brochure 2.